In Bucharest, the situation on the left side of Prut River is known only from the stories about repeatedly suspending Igor Dodon from his position as president or about the unionist demonstrations that are shown on the Romanian TV channels, which distract the attention from Moldova’s real problems. The Moldovan society is facing an economic situation equivalent to insolvency, after one billion dollars was stolen from the national and private capital banks, equivalent to 25 billion USD at Romania’s level. After the fall of ex-Prime-Minister Vlad Filat, the only man who was found guilty for the stolen billion, some international institutions are anemically searching for the stolen money and the present government is promoting, for important functions, the same persons who are suspected of taking part in the robbery of the century. Today, I am discussing about the biggest theft that has ever happened in the Republic of Moldova with the lawyer Andrei Nastase, the man who initiated the protests against the oligarchical government in Chisinau to find out who is guilty of this crime and what are the chances to get the money back. Cotidianul: the Republic of Moldova is known in the world not just for good things but also, unfortunately, for the so-called Robbery of the Century. It is known that the investigation of this case was led by entitled foreign institutions. At the end of the day, does the government want to clarify the case? And where are the stolen billions? Andrei Nastase: The government claims that the publication of the 2nd Kroll Report is an honest concern for the people’s own good. But there are some defining elements, that don’t let the government fool us. First of all, the report was published in the time of winter holidays. It was a subterfuge meant to minimalize its impact. Then, the document was published as a synthesis, which, obviously, does not disclose the persons who really benefited from the robbery of the country’s banking system. Ilan Sor, who is a friend in bad deeds with Plahotniuc, Leanca and Dodon, and whose name is mentioned in both Kroll reports, is the only person who is still playing the role of the idiot useful to the real criminals. The second reason, given by Prime-Minister Pavel Filip, who tried to explain why the report was not published entirely, was because they did not want to create any speculations on the other 90% of “completely honest” officials, which were also mentioned in this report. And this reason is truly embarrassing. And since BNM (Moldova’s National Bank) specified that no Moldovan official has had access to the original version of the 2nd Kroll Report, it means that the Prime-Minister is lying to the civil society, on his behalf, as well as on behalf of others, which is even more embarrassing. C: Should we then think that the summary of the 2nd Kroll Report does not present any interest for the Moldovan society? A.N. : This is not quite true. The good part is that this summary also confirms some important conclusions based on the 1st Kroll Report, published by the government in May 2015, under the massive protests of over 50 000 people, organized by Platforma Demnitate şi Adevăr (The Platform for Dignity and Truth, led by Andrei Nastase). Both reports clearly state that the robbery of the century was a deliberate criminal act of the oligarchical mafia and it was done in pre-established phases, this entire machinery being protected at the highest level in state. In the first phase, in 2010, oligarch Plahotniuc, who then already was the coordinator of the so-called pro-European government alliance, consisting of Filat’s and Ghimpu’s parties, interfered in the activity of Banca de Economii (Moldovan Bank). By controlling the entire judicial system, the Prosecutor’s office and the National Bank, he changed the composition of the minority shareholders, through raider attacks, using for this purpose the businessman Veaceslav Platon. Then, using 77 companies owned by Ilan Sor, around 2,9 billion MDL have been laundered between 2011-2014. I presume that this phase was a period used for testing both the system and the society’s ability of reacting to injustice, which, unfortunately, proved to be very weak, because the entire political class and a big part of the civil society was complicit in this crime. What other important operations took place in the second phase of the biggest banking robbery in the modern history of Europe? A.N. : The second phase can be attributed to 2013, when the state was unscrupulously deprived of 23% of the shares of Banca de Economii, losing, this way, the statute of majority shareholder of this institution. You probably remember that, then, an anxious situation was created around BEM (Moldovan Economy Bank). In those circumstances, our development partners – IMF and World Bank –recommended to capitalize the bank, to make the shareholders allocate their money and to consolidate the management. The state had to give 80 billion MDL for the issue of supplementary shares. That was not such a big amount, but the idea was blocked by the Government and the Parliament, without any discussions. Additionally, that was the period when Filat, Ghimpu and Lupu, the leaders of the governmental parties, signed their inter-oligarchical deal, a deal coordinated by the main oligarch, Plahotniuc, with the complicity of the so-called parliamentary opposition, represented by Voronin and Dodon. As a result, the state gave up the BEM shares for free. Please note that the value of those shares, four years ago, was estimated by IMF at two billion MDL. The entire operation concerning the supplementary issue was organized by the Agency for State Property, which was subordinated to the Ministry of Economy. Veaceslav Negruta, then the Minister of Finance, opposed the idea, and he was later sanctioned for this through an arbitral sentence. Starting from 2009, the Agency has been controlled permanently by the Democratic Party, or, in other words, by Vladimir Plahotniuc. A.N. : Exactly. The most important moment of the robbery happened in 2014, when 1.14 billion dollars were drawn out from Banca de Economii, Banca Sociala and Unibanc, as fraudulent loans. This number meant, in 2014, circa 15 % of the country’s GDP or approximately 55 % of the state budget income! At the same time, 10 billion MDL were laundered through offshore companies. Before this, the government which pretended to be pro-European was preparing to cover, with a dreadful cynicism, the theft with the billions from the National Bank’s reserves. First, they amended the law, through an emergency ordinance, so that the government could issue State Guarantees. On November 7, 2014, the Minister of Economy, Andrian Candu (a close friend to Vladimir Plahotniuc, now President of Parliament) and the Governor of the National Bank, Dorin Dragutan, insisted that the government, which at that time had Iurie Leanca as Prime-Minister, secretly approved the Government Decision No. 938. What did the Decision provide and why was it crucial in this entire story? A.N. : This decision provided that state guarantees should be offered to the National Bank at a value of 9.5 billion MDL, in order to offer loans to the three commercial banks. An important detail is the fact that they did no steal great amounts of money from the banks. Thus, everything had been planned very carefully. Usually, offering state guarantees meant installing, in the banks, a special state administration, that would monitor the activities. Well, no such thing was done. Moreover, in November 2014, Banca de Economii offered loans of 838,5 million USD, and in just two days, between 25 and 26 November 2014, 956 million USD were withdrawn from Banca Sociala! Why did none of the state institutions react to these banking machinations? There was no possible way they could stay unnoticed! A.N. : All machinations concerning the converting and the withdrawal of money from the Moldovan banking system took place because the National Bank, the National Anti-corruption Center, the General Prosecutor’s office and the Information and Security Service chose not to take any action in this matter, thus having their criminal activity in the theft. Why did they do that? At that time, all regulating institutions were controlled by the Communist Party and by Vladimir Plahotniuc, who obeyed Moldova’s ex-President Vladimir Voronin. Once the “pro-European” parties gained power, those institutions should have been freed; instead, they fell under the influence of the new government. The Democratic Party, which in the meantime was bought by Vladimir Plahotniuc, took control of all the institutions that are directly responsible for the financial security of the country – the National Bank, the National Anti-corruption Center, the General Prosecutor’s Office and the Information and Security Service. They were told to stay blind and deaf to all the crimes and so they did, to the great benefit of the oligarch. Only after the banks had been robbed, the National Bank decided to designate a special state administration there. At the same time, the Supreme Judicial Court, directed by Plahotniuc’s ex judicial councilor, Poalelungi, canceled all transactions that were connected to the supplementary issue of shares form 2013 and returned the Banca de Economii control package to the state. Obviously, by that time, the bank had already been robbed. Later, another government, with Gaburici as Prime-Minister, offered state guarantees of 5.4 billion MDL to the national Bank, claiming that they only did it to save the depositors of the three banks. There has been an attempt to give state guarantees a third time, but, under massive protests, organized by Platforma Demnitate si Adevar, the Moldovan people prevented that criminal operation. Shortly after our protests, Gaburici resigned and the government was obliged to publish the 1st Kroll Report. What happened to those who took part in the theft? Was anybody found guilty for it? A.N. : No, they are all good. For example, Ilan Sor was mentioned in the 2nd Kroll Report 136 times! Despite this, he is still free and is the mayor of Orhei Municipality, where he is spending the money he stole and is getting ready for becoming a member of the parliament, supported by the oligarchical government and Plahotniuc itself. Andrian Candu, the President of the Parliament, is talking nonsense about the rule of law; Dorin Dragutan (the ex-Governor of the National Bank) received a huge golden goodbye and went on “vacation”. Iurie Leanca is stating that he is the one who saved the banking system. Very soon, we will see him as the Vice Prime-Minister, alongside Gaburici, who will be the minister of Economy. Another person who played a major role in this conspiracy is Alexandru Tanase, now the minister of Justice, who created the path for the 30 billion USD of the Russian mafia that were laundered in Moldova. There are many persons who claim to be pro-Romanian, in Bucharest, just so that they can spend the Romanian public money, but here, in Chisinau, those same persons are walking hand in hand with the Russian mafia. A.N. : Yes, indeed. A diabolical, a cynical strategy which shows an outrageous disrespect for the citizens of this captured state. In 2016, the Plahotniuc-Filip government transformed the guarantees that were used to cover the theft of the banking system into an internal debt. This means that the government obliged the citizens to return the stolen 25 billion MDL (over 1 billion USD), a sum which is almost the double of the guarantees. The regime even tried to adopt a special law that provided the amnesty and legalization of the capital that came from offshore companies. Thanks to the common efforts of the civil society, of the extra-parliamentary and anti-oligarchical opposition, and of the external partners, the law did not pass. But the criminals did not quit. 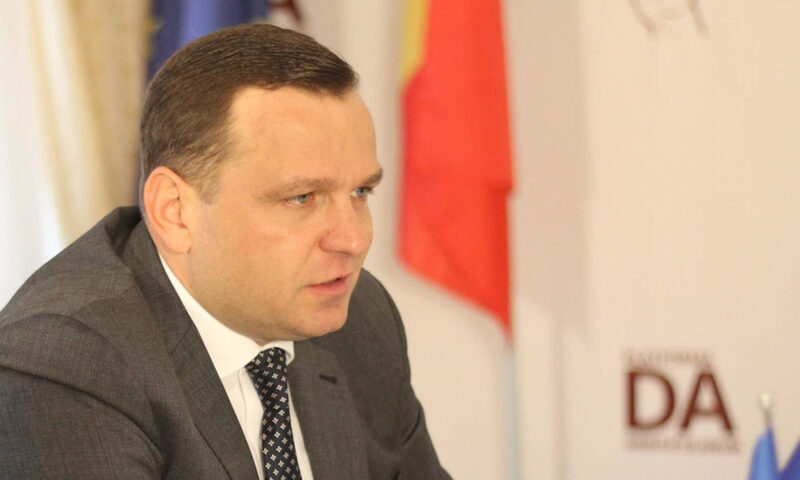 The Plahotniuc-Dodon government introduced a system which basically sells the Moldovan citizenship to persons who “make investments in the Moldovan financial market or buy state value papers”, this way transforming the country into a money laundering paradise. What do you think of the government’s intention to decriminalize their illegal actions? A.N. : It was a rude attempt to exonerate those who participated in the theft and to save them from facing the law for their crimes. It is an attempt to make the recovery of the stolen billions impossible. It is also an attempt to make the participants in the theft keep quiet and not reveal anything that could harm the one who benefited the most from the theft. The government’s intention to decriminalize these economical crimes, following the example of Russia, Armenia, Kazakhstan and the one promoted by Ianukovici, in Ukraine, is an extremely alarming sign. Abolishing the criminal penalty for the criminals who now govern Moldova, alongside with the changes made to the electoral system, means creating a comfortable habitat for thieves, political criminals and all kinds of bandits. The men of honor, the honest businessmen, will be disfavored and insulted, and those who practice economical frauds will be encouraged to continue without any obstacles or fear, knowing that they will never be imprisoned. The Mafioso government is preparing for themselves a dream life. They are now making sure that, even if their names, of those who took part in the robbery of century, would ever be published, they will not go to jail. Platforma Demnitate și Adevăr, the party which you have been leading in the last two years, is one of the few in Moldova that is fighting against its Mafioso government. What are you going to do next? A.N. : We are used to reacting immediately. An example of this is the publication of the unfortunately shortened version of the 2nd Kroll Report. We encouraged the honest prosecutors to initiate an investigation on the elaboration and the approval of the Government Decision No. 938 as of November 7 2014, and to hold liable those who promoted and co-signed this normative law and the administrations at the National Bank, at the National Anti-Corruption Center and at the Information and Security Service. All these persons where responsible for supervising the activities of the banks and the economical security during 2014. At the same time, we were the ones who suggested organizing more massive protests. We had a number of reasons why. First of all, we wanted the government to publish the 2nd Kroll Report entirely, including the chapters that show the real beneficiaries of the stolen money. Second, we wanted to see a result of the trial against Ilan Sor, and we wanted the Appeals Court to make all trial sessions public. Third, we wanted a real investigation and, then, a trial against all the beneficiaries of the theft. At last, we wanted the stolen billions back. Obviously, we will also request the abrogation of the law which states that Moldova’s citizens must pay the 1 billion USD stolen from the banking system. The two ex-Prime-Ministers, Leanca and Gaburici, as well as Candu, Dragutan and Sor, belong to jail. This conclusion is common sense and it is a clear result of the 1st and 2nd Kroll reports. We will not give up, because we do not have the right to. We understand that the Republic of Moldova is on the edge of a true catastrophe. The people are getting poorer and poorer. The emigration index is beyond all limits. Most importantly, we need to take the power away from the Plahotniuc-Dodon cartel and hold them accountable for their actions, and to take from them, as well as from all other criminals, the money they earned by illegal methods.